THIS SPRING will find Lisa in the UK for guest appearances in Bristol and parts Cornwall, early April, where she will be touring with Laurie Leonard (aka Fuzzpotgirl on Ravelry). Easter Saturday, April 3, 2010, will find the two of them at Get Knitted, Bristol's hopping knit shop for a fun filled day of fabric florals and embellishments. Pop in if you are in the area! Would LOVE to meet you! 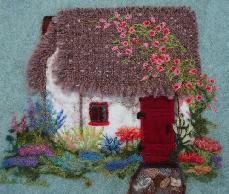 Wee Irish Cottage available in pattern or workshop! Using cut felt, hand-dyed roving and needle felting techniques plus fabric, build your captivating cottage and fit it with a colorful garden of bountiful blooms. Your imagination reigns to bring your fantasy seaside home into a mini reality to display with pride and a faraway look in your eye! Design pattern measures 12" X 12" full size but is easily adjusted to fit your desired dimensions. Also adaptable for pillow, quilt, bag or other object. Enjoy! Morning Glories Glorified and available as pattern and workshop featuring five different techniques. Roses, 3-D design, semi-precious stone and dreamy color in another workshop offering. Fabric may go from ordinary to outrageous! Easy stitch and embellish techniques in mixed media. WORKSHOPS are presently available through private lessons or arrangements. You may schedule a workshop or event directly by using the CONTACT button in the left margin. Please check back for more details at a later date or call to book a class. MR. BLUEBIRD in progress. The tools and techniques in needle felting are simple enough for a child to learn. Play with color and find your muse but don't look away or you'll feel the needle! The tools needed for the job are easy to find in your local yarn store, yarn, roving. A special needle does the work without having to be threaded and it is easy to create your own design and incorporate beads and found objects into your piece. A wonderful medium for children, with a little guidance, that is!. CLASSES offered this year include PICTORIAL FELTING, FIGURES & FANTASIES, MIXED MEDIA, and COTTAGES. Using needle felting to create forms in 3-D and also 2-D scenes can be so easy and very gratifying. EMBELLISHMENTS are also a favorite topic for teaching. If you wish to learn to create any of the embellishments garnishing Lisa's hats, do not hesitate to contact Lisa by clicking on the CONTACT button in the left margin.